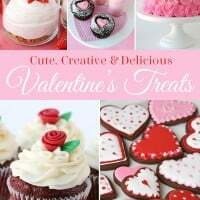 These cute, delicious little Strawberry Cream Puffs are a perfect Valentine’s treat or anytime treat! The recipe starts with Pepperidge Farms Puff Pastry Cups… quickly becoming one of my “go to” easy recipe options! These little pastry cups can be filled with savory foods (as I did recently with these Buffalo Chicken Pastry Bites), or sweet fillings. The filling is simply my Strawberry Cheesecake Mousse, and it’s just the perfect combo of sweet, rich and fluffy. 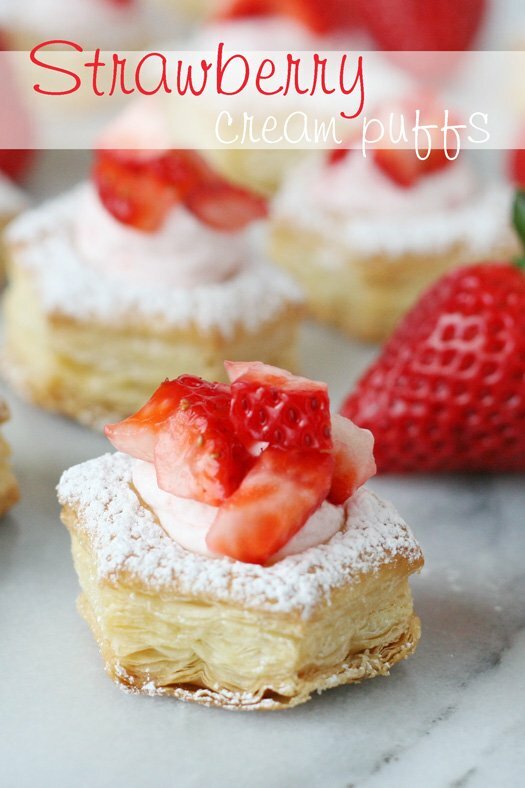 These Strawberry Cream Puffs are such pretty little treats and would be great little bite sized desserts for parties. 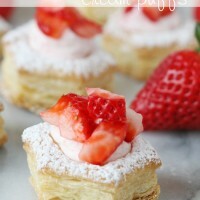 Delicious Strawberry Cream Cheese filling pairs with puff pastry cups for a simple, elegant dessert. Bake pastry cups according to directions on box (check after 15 minutes of baking). Once baked, cool pastries and use a small knife to remove the centers of the cups. 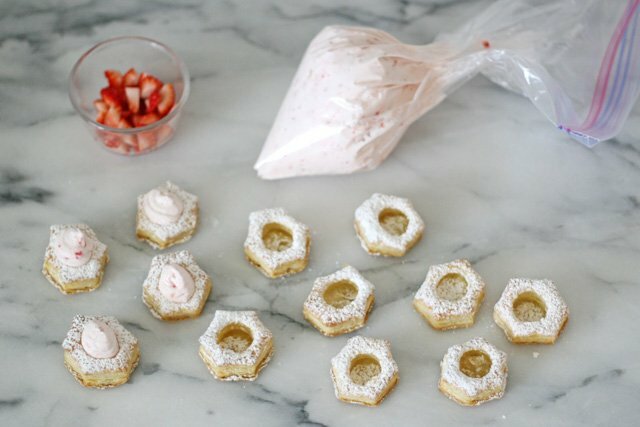 If desired, sprinkle pastry cup with powdered sugar. In a food processor, or blender, chop/blend fresh or frozen (and slightly thawed) strawberries. Process until the berries are chopped, juicy, and no piece is larger than a pea. In the bowl of an electric mixer (or with a hand mixer), whip heavy cream until it begins to thicken. Add powdered sugar, and continue to whip until thick and holds stiff peaks. Move whipped cream to a separate bowl (if using bowl of electric mixer). In the bowl of an electric mixer (or with a hand mixer), beat cream cheese until smooth. Add powdered sugar, and continue to beat. Add vanilla, then add strawberry puree, a little at a time. Continue mixing, and beat until fully incorporated. 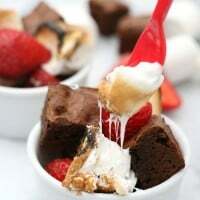 Fold cheesecake mixture into the whipped cream, and stir gently until fully combined. Taste to check for sweetness. If needed, add an additional tablespoon or so of powdered sugar, and fold in gently. Add prepared filling to a large ziplock bag, and cut off about 1/2 inch from one corner. Use this to squeeze the filling into the baked pastry cups. Top with a few pieces of finely chopped strawberry. Serve immediately, or keep in the fridge up to 1 hour. The filling may be made up to 1 full day ahead of time kept (covered) in the fridge until ready to use. 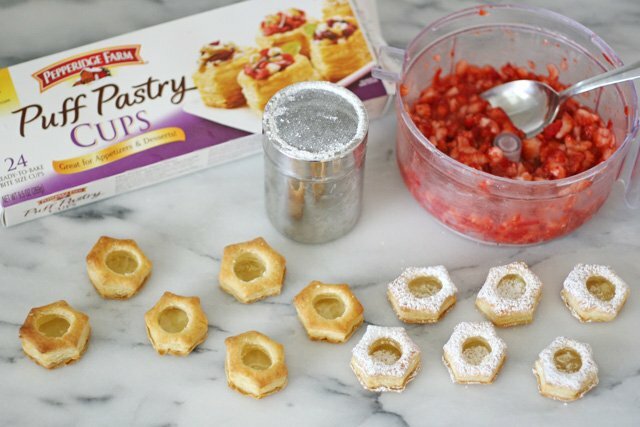 Using the full recipe listed above you will be able to fill 24 mini pastry cups and you may have some filling left over. Feel free to make just half of the filling recipe if you're baking less than the full package of pastry cups. 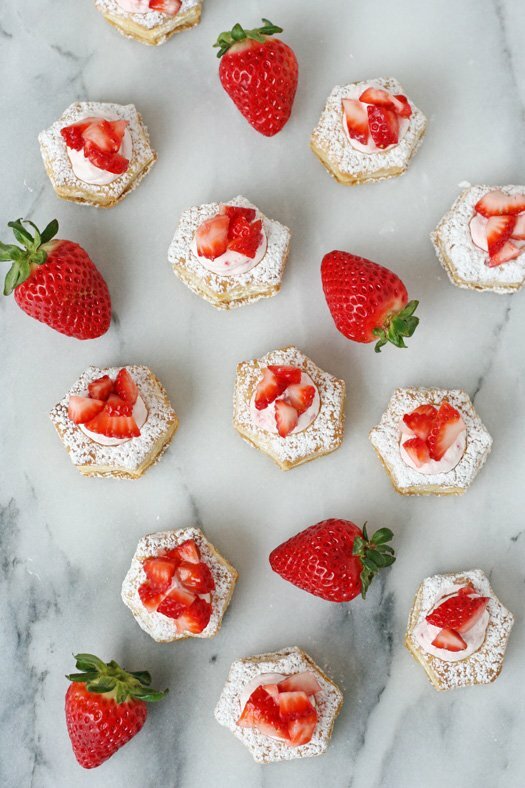 Once baked, sprinkle the puff pastry cups with powdered sugar, then fill with strawberry cream cheese filling (using recipe above). Garnish with some additional diced strawberries. Last month I shared these Buffalo Chicken Pastry Bites and asked you to share your ideas for using Puff Pastry. Over the next couple months I’ll be bringing you delicious and creative recipes using Puff Pastry and choosing my “top pick” from your suggestions from the previous month. In the spring, I will chose my favorite from the highlighted “top picks” and that reader will win a grand prize trip to travel to the Pepperidge Farm Headquarters! I love using the puff pastry sheets to make what I call “squared and flared” cups (sheets cut into squares and then layered in a muffin pan to create a cup). I fill them individually with my homemade spinach dip or artichoke feta dip and garnish with big flakes of parmesan and maybe some small diced tomato- yum! The flaky, buttery cups just melt in your mouth when paired with the rich, creamy dip! 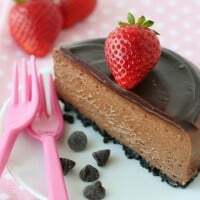 Just the thought of strawberry cream cheese mousse make my mouth water! I love strawberry desserts and what I especially love about this one is the fact that you don’t have to make the pastry from scratch! Where did you get the container that you use to sprinkle the powdered sugar? I gotta get me one of those! What a beautiful and easy dessert!! Perfect for a Tea or Brunch!! My favorite are cream cheese pastries. 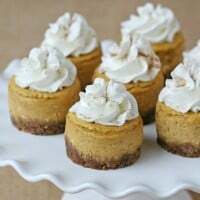 Simple and delicious, it’s the only thing people want me to bring to any party! All you need is Pepperidge Farm puff pastry sheets, cream cheese and sugar. You bake the pastries with the cream cheese and sugar already inside so they are delicious hot from the oven. Be careful not to get burned! These look fabulous, Glory! For any season! Make a mini blackberry pie. Mix your favorite fruit with sugar or w/out sugar. Mini chicken pot pie – Add a little chicken and some veggies. Hi Glory! These cream puffs look absolutely delicious! 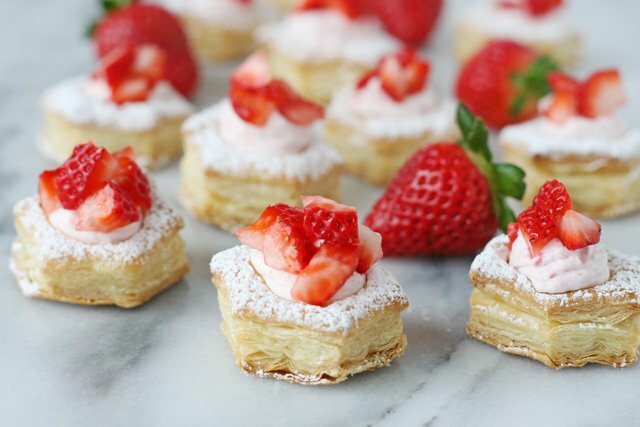 Where can I find these puff pastries? Ive looked for them at a few grocery stores and cannot find them. I NEED to make these for easter brunch! Please help! I also had a difficult time finding these. If you call Pepperidge Farm, they will tell you where you can find them. I live in New England and the only places that carry these are in Connecticut. I was able to get 5 boxes from there but it is far from where I live. Good luck. Can the cream cheese filling be frozen and used at a later time? How long can it be stored in the fridge? Hi Ara, I have not tried to freeze the filling. The filling comes together so quickly I do know if it would be necessary to make ahead and freeze it. As noted in the recipe, the filling can be made up to 1 full day in advance and stored in the fridge. Hi Glory! Not sure you’ll even see this in time…(by the way, you may or may not remember me from flickr…cookie jan (now kiss my buttercream, but i mainly post on my fb kiss my buttercream page vs flickr). Anyway, love me some strawberries! So i have these currently baked and everything ready to fill them. I plan on taking them to my work tomorrow as we just moved to a new office and tomorrow is our grand opening there. Will these be ok in the fridge overnight? should i put them in a container? or can i leave them just on a cookie sheet to carry? Jan!! Thanks so much for the comment and for giving me the reference so I know who you are. I remember you! Sorry, I’m not usually able to reply to comments on the same day, so it looks like I missed your time window for this! I would say I’d make the filling and keep that in the fridge, then bake the puffs and keep them covered at room temperature, and then fill the puffs the same day you plan to serve them.